DKB Bank offers all retail customers including students with the free and attractive checking /current account. DKB-cash offers you a completely free package for your current account, including ATM card, VISA card and top credit interest of 1.05% pa. Probably you have heard of DKB Bank Account, maybe not. But if you are student and considering why you should open a DKB Bank Account for students, then here are four good reasons why a every student when studying in Germany should open a DKB Bank Account for Students. 1. Partner in all your travels – Free cash withdrawals worldwide. It provides a free VISA credit card with free cash withdrawals from any ATM machines anywhere in the world. The Visa card is accepted in any ATM’s worldwide and with more than 1 million terminals worldwide, you are sure to find one anywhere. Irrespective of whether it is traveling within the Euro currency or across the globe in South America, cash withdrawals are free. Unlike other banks which earn through the currency exchange rate, DKB bank also provides a very fair exchange rate. DKB bank offers always free checking account. This no condition account it is a free account, you can still maintain the bank account after you have completed your studies, irrespective of how much balance is left or how often you make a transaction. Even if you leave the country after your studies, you can still have an Euro currency bank account and withdraw from anywhere in the world free of charge. With 1.05% interest per month, your deposit earns among the highest rate of interest in Germany. While most of the checking accounts in Germany earning nil interest, and utmost a paltry 0.2% interest, with DKB VISA account, you can earn 5 times more in interest than the normal checking account in Germany. With the DKB Bank Account for students, you get a free ISIC member card which acts as your students identity card which helps you get additional students discounts. More details about the DKB students card with ISIC card is provided below. Moreover, DKB checking account gives you access to DKB-Club benefits which includes upto 17% cash-back on selected online and in-store purchases. DKB-Cash members also get free entries to certain events and clubs in German cities. 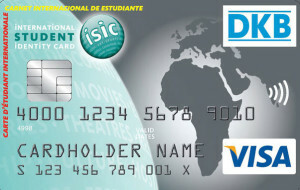 The DKB-student-card combines all the features of the DKB VISA card and the International Student Identity Card (ISIC). You benefit from the advantages of internationally recognized student ID by ISIC and a free DKB-Cash VISA Credit Card. b) ISIC City Discounts: Worldwide more than 41,000 discounts. 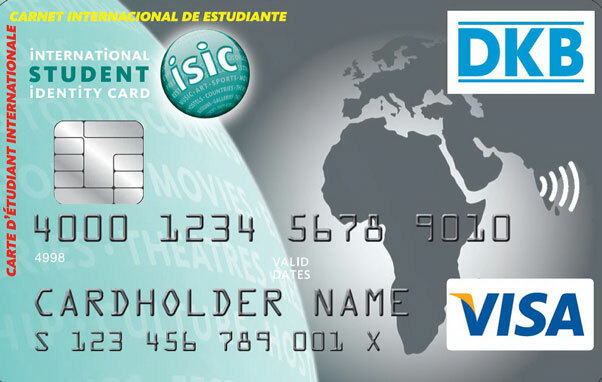 Simply use the ISIC DKB-student-card and receive direct benefits, such as for transportation, theaters, hostel, cinema and much more. How much does the DKB-student-card cost? Normally the ISIC card costs €12 per year. However, the DKB Student Card with ISIC students card is absolutely free. What requirements to obtain a DKB-student-card? DKB student card is valid for four years. However you have to prove to DKB bank of your student status every year. Once the account is open, upload your current student registration certificate (Immatrikulationsbescheinigung) and a photo to DKB bank and they will issue the ISIC card. Open a DKB Bank Account for Students. Does DKB has blocked account too? Unfortunately DKB does not open blocked accounts for students. The blocked accounts are only offered by banks with branches (such as DeutscheBank, HypoVeriensbank, Sparkasse etc) and not by online/internet banks. But you can of course open a blocked account in another bank and also open a DKB students bank account as a second bank account for its free credit card. You can then set up automatic transfer from your blocked account to DKB account each month and use you DKB card withdrawing and making other payments. How much is the monthly charge for using ATM ? Is there any charge for online transactions and card payment?